Every year, across snow-country in America, do-gooders and thrill-seekers choose to jump into freezing water to warm hearts. If you’re thinking that sounds crazy, you’re right! It is crazy fun and called the Polar Plunge. This year, in 21 communities across Minnesota, volunteers from law enforcement agencies, emergency medical services, and fire departments will erect warming tents, inflate giant polar bear balloons, and cut holes in ice thick enough to hold a small city of spectators and volunteers in preparation for their Polar Plunge events to support Special Olympics Minnesota. All that just so more than 11,000 well-intention weirdos can don wigs, tutus, and adult onesies as they jump into a few of our 10,000 lakes in order to raise more than $2 million dollars statewide. “The plunge is a most gratifying experience. It’s an event for all ages and stages; for those who are looking to stretch their ‘norm’ and do so for a cause. My favorite part of the plunge is walking off the shuttle to a welcoming line of people I’ve never met before, but who are willing to high-five me and encourage me in my efforts for the day. I sense community when I’m at the plunge,” said Kim, PMG TST member. For the second year in a row, PMG chose to support Special Olympics Minnesota for its Q1 charitable initiative by forming a plunge team and raising funds. The 2.0 version of Team PMG almost doubled its total plunger count (from 7 to 12 PMG-ers) and more than quadrupled its funds raised (from just under $1200 in 2018 to just over $5100 this year). All donations supported the Plunge event held at Prior Lake on February 16, 2019. Money was donated by friends, family, coworkers, partners, and client companies. 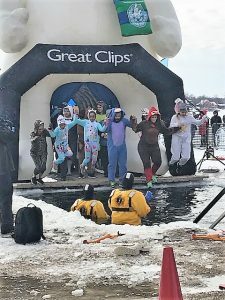 These efforts led to Team PMG ranking as the top fundraiser among small businesses, top three among corporations of any size, and number seven overall from all donor entities combined for Prior Lake’s Plunge event. PMG is still currently in the top 10 Small Corporation Fundraisers which consists of participants for all 21 plunge events statewide! To put those numbers in proper perspective, $5000 can help start 10 new Special Olympic delegations across Minnesota, feed 1000 athletes at a state competition, start 20 new respect campaigns in local schools, or fully sponsor 2.5 Minnesota SO athletes for the USA Special Olympics Games. 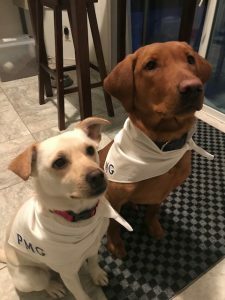 Those amazing results, and the fun had achieving them, are just a couple of the reasons why it is easy, as an employee, to be proud of PMG. In an ever-changing employment market that is drawing from an ever-shrinking talent pool, it is worth mentioning that millennial and subsequent generations now entering the workforce are almost unanimously cited as claiming that increased opportunities to give back to their communities and build engagement in their workplaces are as important (if not more so) to them than pure compensation and benefits. To put it plainly, younger workers want to work for companies that care. If you’re looking for ways to make your younger workers inclined to feel the same about your company, maybe you should consider doing something crazy next year and take The Plunge! As part of our commitment to community involvement, in Q3 PMG directed an internal school supply drive to collect donations for the Twin Cities Kids in Need Resource Center (TCKINRC). Coupled with the school supply drive, PMG’s Executive Team proposed to match up to $2,500 worth of school supplies raised and donate the money to Second Harvest Heartland, an organization that provides meals to communities most in need. Over the course of three weeks, the PMG team managed to raise a total of 278 backpacks filled with supplies and $8,817.80 in cash donations for TCKINRC. Alongside this, PMG donated $2,500 to Second Harvest Heartland. To wrap up the initiative, PMG employees delivered the donation to TCKINRC on August 10 and spent the afternoon working in the warehouse and packing nearly 400 backpacks to be given to kids for the 2018 school year. PMG makes it a top priority to give back to the community whenever possible. At least once per quarter, the PMG team picks a foundation that we can support. In July, PMG is raising money and school supplies to donate to Twin Cities Kids in Need Resource Center (TCKINRC). TCKINRC provides students in need with the essential school supplies needed to promote learning and excellence in the classroom. The Kids in Need Foundation works with schools facing high poverty rates in St. Paul and Minneapolis by providing eligible teachers the opportunity to select supplies at their free store. Last year alone, the Kids in Need Foundation helped 200,000 teachers and 6.2 million students! In its 23 years of operation, it has distributed more than $900 million in school supplies to kids who would otherwise go without. PMG is proud to support such an amazing organization. If you are also interested in offering support, visit their website to learn more!